What Does the Average Home Value Mean for the Average Home? Is your home worth more or less than when you bought it? The assessed value of your home is essentially the estimate of what a buyer would be willing to pay for it, should you want to sell. In New Braunfels and our tri-county area (Comal, Guadalupe and Hays), that value has seen a steady trend upwards over the last 10 years. This data provides a good visual aid of how your home owner investment is growing in the New Braunfels region. The average home value is computed by taking the total assessed value of all homes in the city and dividing it by the total number of homes in the community. As shown in the graph, there has been a steady rise in home values within our area. One of the most intriguing data points on the chart (and usually the first point that your eyes focus on) is the spike in average home value in 2015 for the tri-county area. While this was a great one year trend, it was not able to repeat the same gain year-over-year. In fact, it trended down and at a much greater rate than the City of New Braunfels and New Braunfels ISD. So what does this mean for you? It means that it’s likely the value of your home has increased over the last several years. 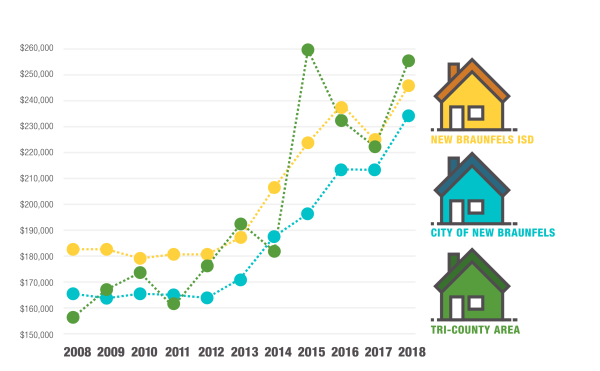 The graph also shows that the value of homes in the City of New Braunfels have enjoyed a more steady rate of growth while home values in New Braunfels ISD and the tri-county area have been a little more fickle. Continued growth can be a sign that there are a lot of buyers looking for houses in the area. Couple that with information from the Four Rivers Association of Realtors stating that the median home price, active listings and closed sales have all increased over the past year and you could conclude that our community is currently experiencing a healthy and growing housing market. Citizens, employers, and potential employees can utilize this data and other available information to assess what they are likely to experience in the New Braunfels home market.